Dhaka University has 5 different units with different subjects. Each of the Unit has different requirements. Here we have added all the units’ requirements with subjects. Applicants will be required to take admission test formalities through Dhaka University admission website. Thank you very Much For Staying With us. 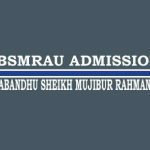 If you need more information about Dhaka University Admission Test 2018-19 to keep connected with us. Let us know about it in the comment form.